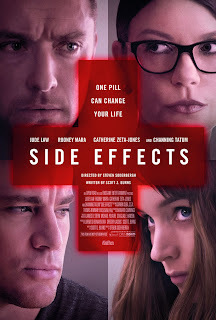 Recently I saw the film Side Effects, I purely went to see it because it has Jude Law and Channing Tatum in it. If you haven't seen it already I would highly recommend that you go and do, it was amazing, really interesting and it had a lot of unexpected twists and turns. The general plot without going into too much detail is: it's about a young woman's world getting turned upside down when she has unexpected side effects from a drug her psychiatrist has prescribed to her. While I was going into the cinema I found myself kind of knowing what this film is going to be about or expecting to know the gist of the story but once I watched it and it ended I found myself questioning what I just watched, in a good way. When the ending came I went really? Seriously? I guarantee that you will feel the same way too. For example Emily Taylor one of the main character's who has the side effects played by Rooney Mara at the beginning of the film I think the whole audience felt sorry for her well trust me by the end of the film you won't feel sorry for her any more. Now this was the first time I had seen Rooney Mara in any film and I have to say she was amazing in this, incredible acting I really liked how she could twist her character so that the audience can feel sorry for her at one point and then they can feel a completely opposite and different emotion towards her character the next. She is a very beautiful actress and I really liked her hair and makeup in the film. Now as I said earlier one of the reasons I really wanted to see this film was because of Channing Tatum. I have to say I really liked his acting in it, I love him anyway but he wasn't in it enough, at the beginning of the film you think you can kind of guess what is going on but when you see the film unravel all of your previous thoughts and ideas go out the window. Channing Tatum plays Martin Taylor who is the husband of Emily Taylor in the film. Another reason why I went to see this film was because of Jude Law. Now I really love Jude Law and acting in this was amazing and incredible. He plays the psychiatrist, Dr. Jonathan Banks, I really liked how he played his character and how in the story his life is also turned upside down by Emily Taylor who is his patient in the film. Again I thought it was really clever how the audience could feel different emotions towards these characters. The last main character is Dr. Victoria Siebert played by Catherine Zeta-Jones. Now personally I'm not too keen on her however everyone is different and I thought she played her character really well and her character gets what she deserves as does Emily Taylor. Overall I would recommend this film, I liked how it started in the same place and it ended in the same location as well and the film wasn't too long or too short it went on the right amount of time for me. This film is a drama thriller, with a lot of twists and turns the music was really good which helped with the film. I hope I have done the film justice by this review and please comment telling me what you think as this is my first film review on my random blog. I would like to do more film reviews on here if you like reading them so let me know. What did you think of the film Side Effects?